Many of us all participated in meetings, conferences or group discussions where someone was assigned to take the minutes. Ugh! For many, that is an arduous task. Who said what? What was that point that our manager mentioned that was central to a portion of the discussion? Did I capture what our colleague verbatim? There are few apps "for that", but at this time of writing there appears to be only one app that actually gets it right. 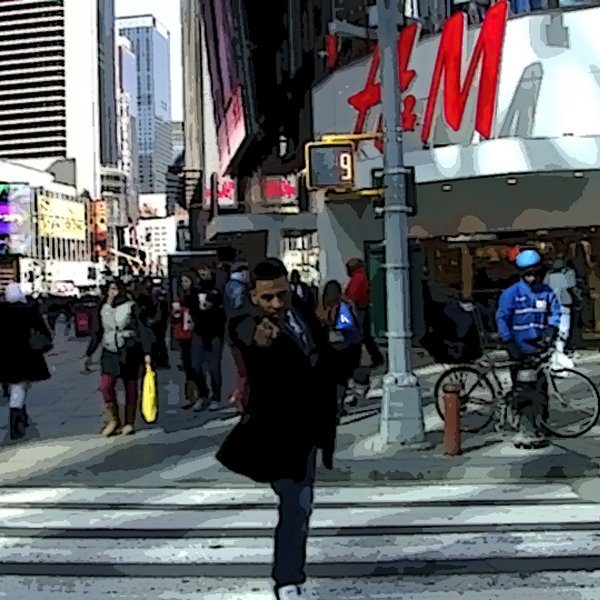 Reason8 literally comes to the rescue for this type of application. Yes, there are note taking apps that will convert your speech to text so you can edit later, but Reason8 for iOS and Android takes this many leaps further. In a Nutshell, Reason8 works across multiple devices. To get started you need to sign up. You can do this using your email or log in automatically using your Facebook or Google credentials. Once you're in, you either need host or join a meeting. You can do this by tapping on the microphone icon on the bottom right corner of your display. Choosing the former will make your device the master with regards to all of that particular meeting's parameters. Whichever option you choose, a Meeting ID will be generated. Either share this ID with your collegaues or ask the host for it so you can join in. From there, your meeting session will commence and the app will begin listening for audio. Anything you say in front of your device will be collected and displayed as your contribution when a transcript is generated in the end. 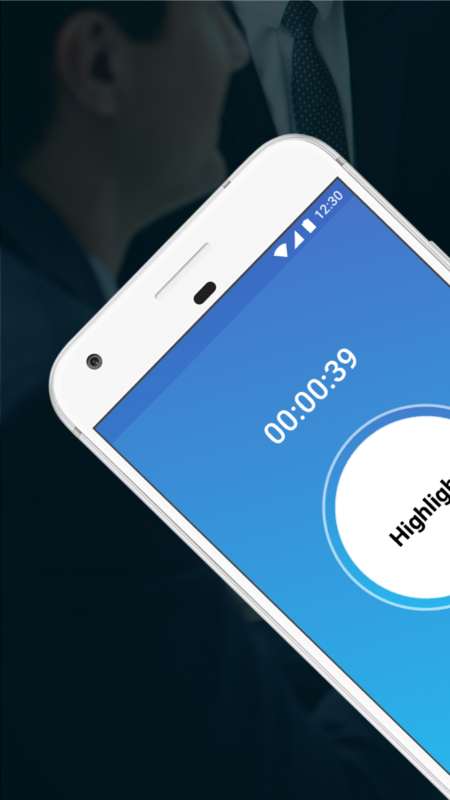 In this "Meeting Mode", you'll see a large "Highlights" button. Hold this down for anything pertinent that you may want to contribute. When all is said and done, end your session. When the session is ended, the app will spend time processing your transcript. If everything was set up properly, you'll end up with a color coded transcript in dialog format complete with each member's contribution. You can see an example of our transcript below. 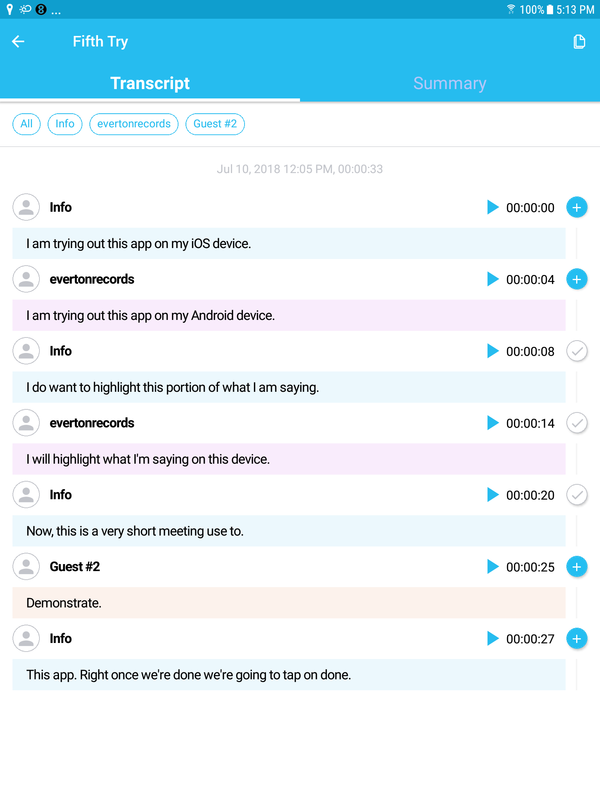 Since there was no actual formal meeting taking place when we tested the app, I put two devices about 18 inches apart and spoke into each of them back and forth. This mimicked how audio would be captured by each device if an actual discussion with several people took place. The results were outstanding. Reason8 makes use of Google Speech To Text engine but combines that with their own proprietary technology which improves accuracy. Reason8 states that their accuracy rate clocks in at about 96%, for us it was closer to 100% as long as we spaced devices accordingly. Otherwise, crosstalk will make it so it appears as if one person was contributing to the conversation for the whole session. 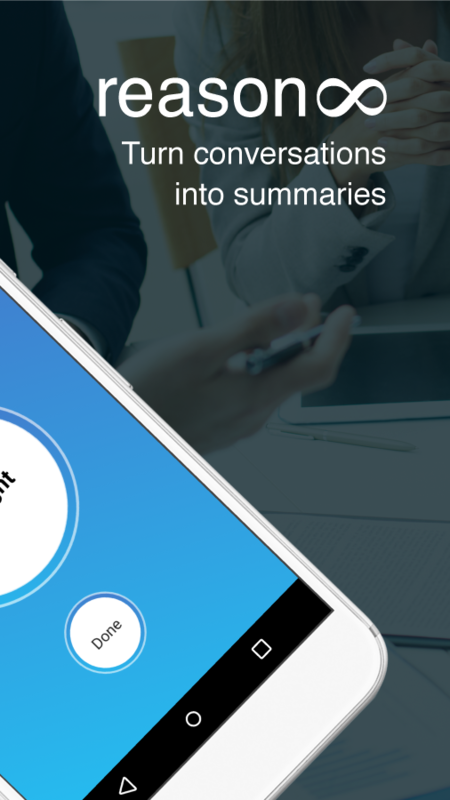 We have reviewed quite a few note taking apps which converted speech to text, but none so far have been as useful and as easy to use as this for the type of application, meaning meetings, conferences and formal discussions which need a detailed transcript generated at the end. The proximity to other users affecting accuracy issue is to be expected to a degree, especially if you've had any experience with apps which allow for audio from multiple sources. 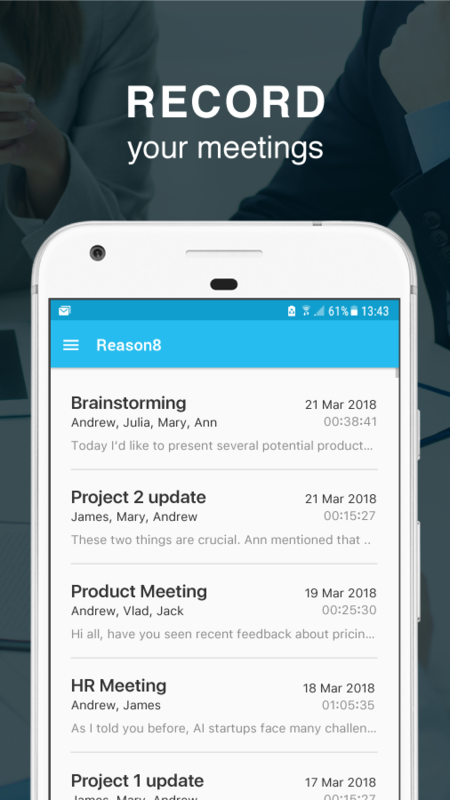 Whether you're in a corporate meeting or having a class discussion, you'd be hard pressed to find a better tool than Reason8 to help you generate detailed transcripts, highlights and a comprehensive summary. Did we mention it is free and multi-platform? That is certainly hard to beat. Like This App Review? Chat About It And More In Our GiveMeApps Community!